Navy Wife Life: Curiosity + Cat = ? Curiosity + Cat = ? Pumpkin has a certain fascination with the bathroom. No matter what we are doing, if we are in the bathroom, he'll come running. I don't know what his first house was like, but we let him explore. If you keep it from them then they want it even more. 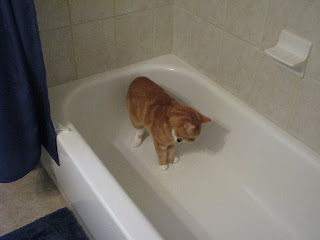 The bathtub in particular fascinates him. I'm sure he's trying to figure out why we would submerge ourselves in water when a tongue bath is just so much more efficient. 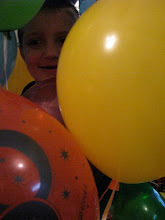 Of course the moment I bring out the camera that little smarty stops doing all the things that I think are adorable. I swear they have a spidey sense about me and the camera. As you can see he has that very put upon look on his face. Almost like he's a little annoyed with me for trying to steal his soul. The first photo looks like he's searching for the water that's normally in there. Hey! Where's the water? He looks so very confused. But if I put the water in the tub he'd be off like a shot. 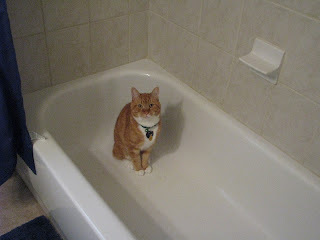 There's no way he'd want to take a human bath. He's already shown me he doesn't care for the shower. 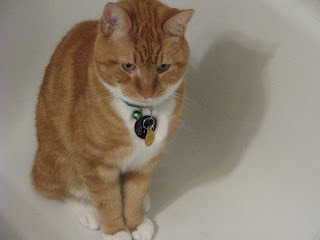 But it is fun to peek in and bat at the water when his crazy humans are taking a bath. You didn't know Guinness the kitten, who would bust into the bathroom of my apartment anytime a woman was in the shower and sit on the shelf in the back, just WATCHING.